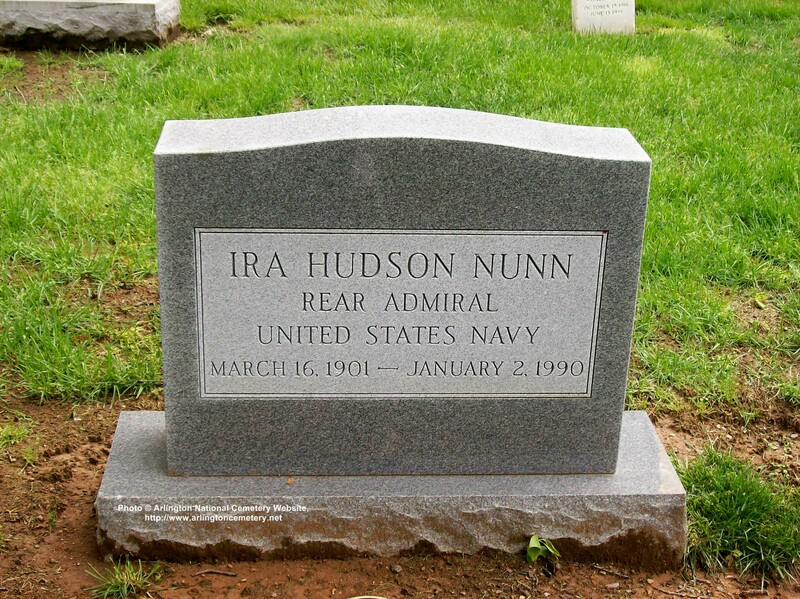 Ira Hudson Nunn, 83, a retired Navy rear admiral and highly decorated combat veteran of World War II who served as the Navy's Judge Advocate General from 1952 to 1956, died of cancer January 2, 1990 at Goodwin House West in Falls Church, Virginia. Admiral Nunn was awarded a Navy Cross, the second highest award for valor next to the Medal of Honor, for his actions as commander of a screening operation during amphibious landings on the Philippine island of Leyte between October 18 and October 29, 1944 in World War II. He was cited in the award for "pressing home numerous successful attacks against hostile aircraft and surface ships during this decisive engagement in spite of repeated attacks by Japanese suicide bombers in submarine infested waters." He was also awarded two Bronze Stars for combat operations as a destroyer commander, including participation in the sinking of enemy submarines, in the 1945 landings at Okinawa. Admiral Nunn was a native of Camden, Arkansas, and a 1924 graduate of the U.S. Naval Academy at Annapolis. He served at sea during the 1920s, then was assigned to Harvard University law school, from which he graduated in 1934. He was assigned to the Asiatic Fleet before the war. He then served in Washington as an aide to the Vice Chief of Naval Operations before returning to destroyer duty in the Pacific. Postwar assigmnents included command of a cruiser, then duty as senior aide to the chief of naval operations, Admiral Forrest P. Sherman. After serving as judge advocate general, the last line officer to hold that post, he was a senior member of the United Nations Command at the Military Armistice Commission in Seoul, Korea, and chief of the Military Assistance Advisory Group in Norway. In 1963, Admiral Nunn retired from the Navy after commanding the Midwest Naval District at Great Lakes, Illinois. He was awarded a Legion of Merit for that assignment. Upon retirement he returned to the Washington area and served 10 years as D.C. counsel for the National Restaurant Association. His wife, the former Esther Wagner, died in 1969. Survivors include a daughter, the Rev. Frances Nunn of Arlington. March 16, 1901-January 1, 1990. Admiral Nunn, was buried with full military honors in Section 30 of ArlingtonNational Cemtery. His wife, Esther Wagner Nunn, who died in 1969, is buried with him. The President of the United States takes pleasure in presenting the Navy Cross to Ira H. Nunn, Commander, U.S. Navy, for extraordinary heroism and distinguished service in the line of his profession as Commander, Task Group 77.4, in action against the enemy from 18 to 29 October 1944, during the Battle of Leyte Gulf in the Philippine Islands. His conduct throughout was in keeping with the highest traditions of the Navy of the United States.